Sandwich Makers In India: In today’s world, for every house hold, sandwich maker is must require thing to have. Not for class but every house has at least 2 sandwich lover and why shouldn’t it be? Making sandwich in morning breakfast is time saving and one of the tasty breakfast, am I right ladies? So, instead of making sandwich manually, why can’t we have sandwich maker which can makes things easier for us. If you have best sandwich maker in your kitchen, you can save up to 15-20 minutes in morning daily. A sandwich maker is an integral part of our morning breakfast. Buying the best sandwich maker for your home can be a difficult and time consuming task specially when you are doing it for the first time and have your hard earned money at stake. Very handy for making toast sandwiches with fillings like Omelette,. Cheese. Potatoes, baked beans etc. This non-stick sandwich toaster saves oil and fuel. There is nothing better than a sandwich with a glass of juice in the breakfast. You can make a sandwich in no time if you have a good sandwich maker in your kitchen. The ones who’re always late for breakfast, know the importance of it, as it saves time, and you can utilize it in getting earlier in office or workplace. These sandwich makers can add extra flavor to your favorite sandwich. Let’s have a look on the best available in the market. 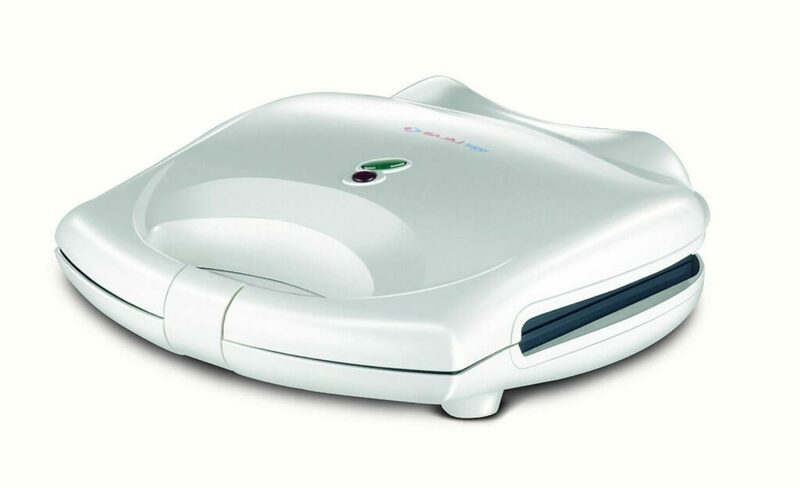 Panini Sandwich maker: The Panini Sandwich maker not only grills sandwiches but also acts as a toaster and a griddle. Apart from making the tasty grilled sandwiches you can also make pancakes, burger patties and even kebabs. Four-triangle Sandwich Maker: The Four-triangle Sandwich Maker is the most common one, and it has a close down design that binds two pieces of bread with filling inside together and grills it. This is great for a quick tasty sandwich made from any filling. How To Choose a Best Sandwich Maker? Choosing the best sandwich maker in India may not be an easy task for many. While our comparison guide can make it easy to quickly know about the top rated sandwich makers, we still recommend you to keep the below points in mind while purchasing a sandwich maker. Sandwich presses come as two or four sandwich models and there are also different sizes within these. Larger-sized models are generally more versatile. Think about how many sandwiches you’ll make at once. Ease of Use and Cleaning : The sandwich maker you are going to buy should be easy to use and maintain. Non-stick Surfaces : It ensures that the sandwich and cheese does not stick to the surface of the sandwich-maker. This helps you to prepare sandwiches with minimal oil. Features :- Most of the sandwich makers are having some common features like non-stick body, LED light for notification, grill or plates for 2 bread and many more. Do check the size of the grill plates. Like prestige sandwich maker has big size of plates for breads compared to Philips sandwich maker. Brands :- It is good have good brands sandwich maker. As you might need them after sales (for service) too. Having good brand which provides good after sales service is much needed. Philips, Prestige, Bajaj are some of the good brands we have. Price :- Do make sure you don’t end up buying high price sandwich maker at less features. Do check the price of sandwich maker before you buy. 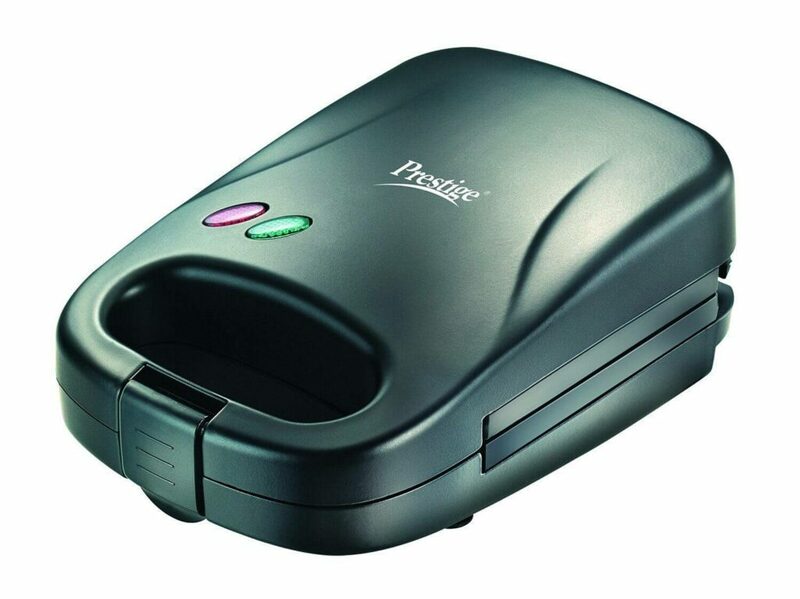 We have provided link to check price of each of the sandwich maker, do check it out. Most of the sandwich maker has price range of Rs.1500-2500. The Prestige PSMFB 800-Watt Sandwich Toaster accompanies a non-stick warming plate that let you make delicious toasts with no sort of trouble in the further cleaning process as no bread piece will stall out in the machine. A rich dark completing body shows up of this specific item more appealing and it gives a keen look to your kitchen too. 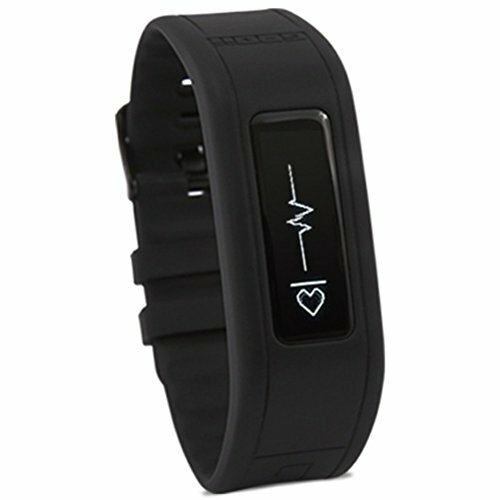 Alternate adornments like a guideline manual and guarantee card will make the working of the gadget all the most simple as you will come to know more about the items. It is likewise a vitality proficient item along these lines, one doesn’t need to stress over their power bills. The working is very easy. Fixed grilled plates are provided with it. The constant power supply is required while working. Customers ervice is not so impressive. 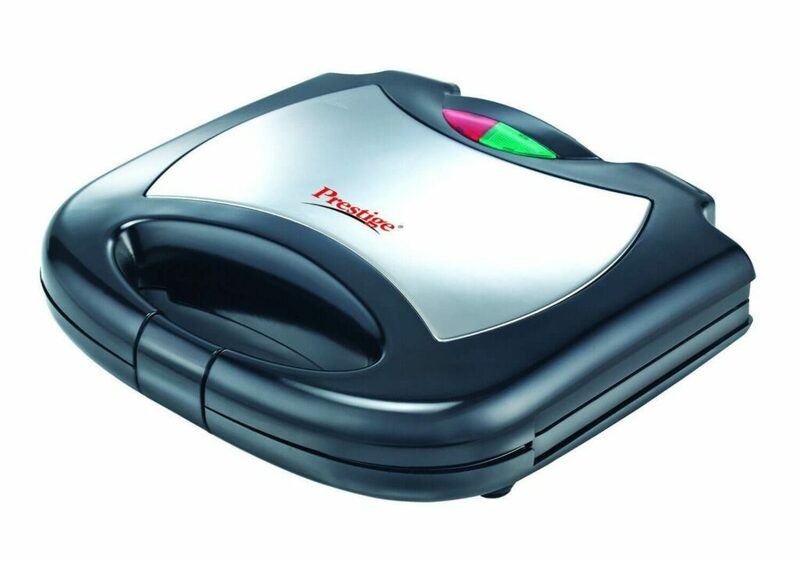 The Prestige PSSFB 500-Watt Sandwich Maker/Toaster Settled barbecue plates are given so as one can likewise appreciate flame broiled sandwiches. It is an extremely interesting item as a solitary sandwich will be delivered, however, the stuffing and all is same as other sandwich makers. A non-stick warming plate likewise functions admirably with this specific model as there will be no sticking of cuts of bread in the center entering of the gadget along these lines, later additionally it will be anything but difficult to clean the gadget. The elements of this model are additionally simple which implies you can undoubtedly utilize it with no trouble. A cool touch body design is provided. The non-stick coating is done on the surface of sandwich maker. Not safe to touch the surface while working. The quality is not so good as other products. 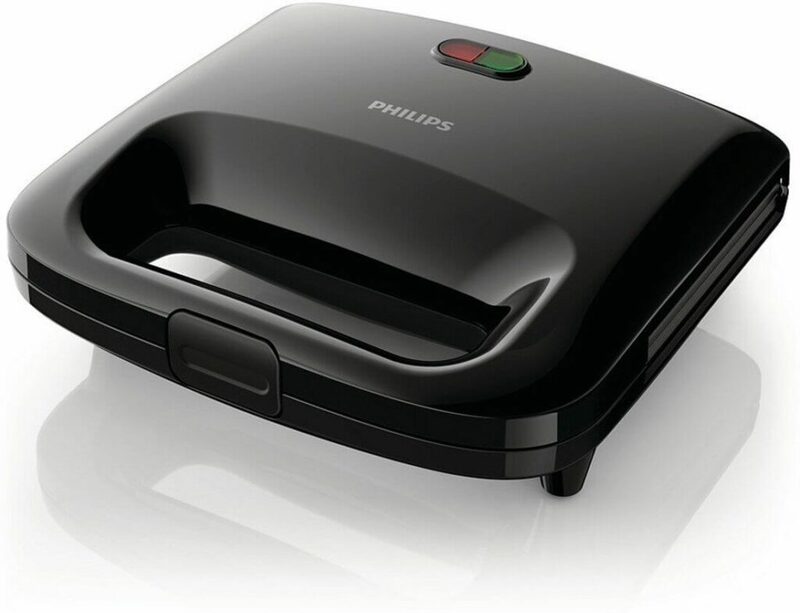 The Philips HD 2393 820-Watt Sandwich Maker has an easy push-down lock system installed within it that is a very good property if we consider it as a safety feature. A special non-stick coating is applied so as there will be no sticking of bread pieces in the middle of the sandwich maker and later also, there will be no difficulty in the cleaning of the device. A vertical, compact storage and high power are provided for fast heating results along with a ready to cook light feature. A cool touch handle is present so we can easily carry the sandwich maker. A rubber also ensures that it stays in one place at the time of cooking. Adjustable height control feature is present. Quality is not so good as compared to other products. Constant power supply is required. 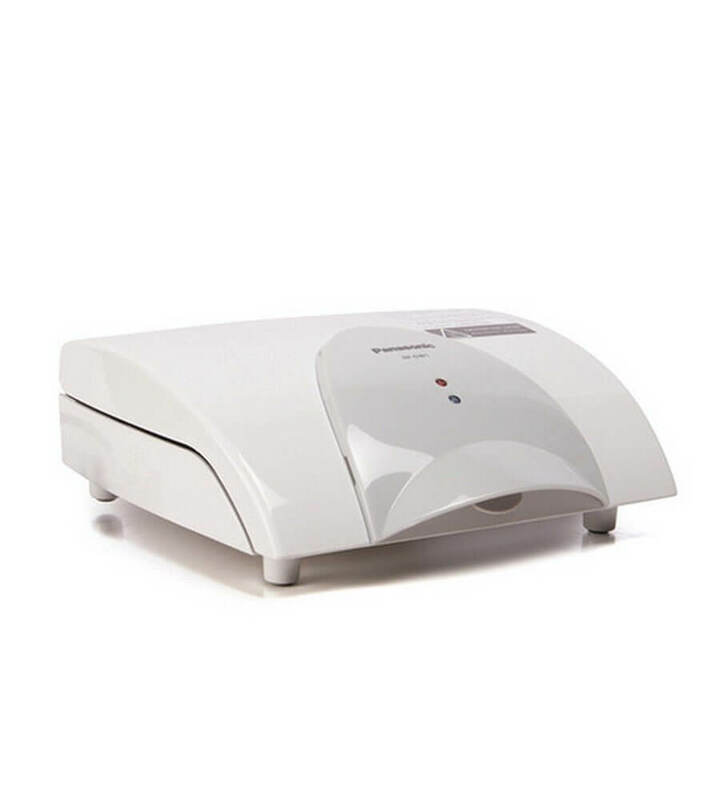 The Hyundai Atom HTA02WSP-DBH Sandwich Maker (White) is a non-stick sandwich producer with hey review innovation, which implies that no bread can stall out amidst the sandwich creator. Light indicators(Red for power/radiator; Green for barbecue prepared or cut-off) are additionally introduced for demonstrating about the operations that are being performed or the operations that are as of now done. Different elements like slip safe feet and thermostatically controlled are likewise introduced inside this specific model to expand the life expectancy and also the execution of the gadget. Took more than usual time to cook a meal for 6 persons. The Nova NSM 2410 750-Watt 2-in-1 Sandwich Maker (Black/Silver) has a 2 in 1 work that joins separable plates that implies one can undoubtedly take out the sandwiches with no staying issue. Effectively separable plates likewise bring about delivering triangle and flame broil molded sandwiches which are extremely delectable and also appealing. A non-stick covering plate keeps the staying of bread amidst the gadget that further aides in the cleaning procedure. A cool touch handle is given that gives you a chance to convey it with no trouble. Temperature controlled by an indoor regulator is additionally present in this specific model. A superior quality material is used. Customer support is not satisfying. 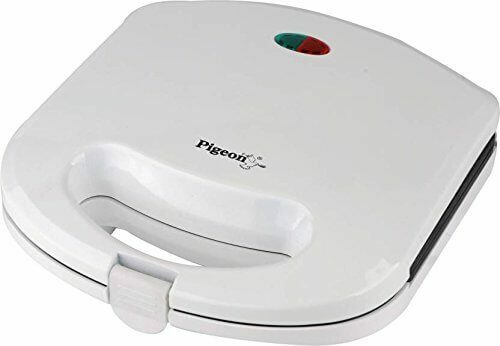 The Pigeon Sandwich Toaster White goes with a non-stick warming plate that let you make scrumptious toasts with no kind of inconvenience in the further cleaning process as no bread piece will slow down out in the machine. A rich dim finishing body appears of this particular thing all the more engaging and it gives a sharp look to your kitchen as well. Exchange enhancements like a rule manual and assurance card will make the working of the contraption all the most basic as you will come to know more about the things. It is in like manner an essentialness capable thing thusly, one don’t have to worry about their energy bills. The non-stick coating is applied on the surface of the model. The Prestige PCMFS 800-Watt Sandwich Toaster Settled grill plates are given so as one can moreover acknowledge fire seared sandwiches. It is an amazingly intriguing thing as a single sandwich will be conveyed, in any case, the stuffing and all is same as other sandwich makers. A non-stick warming plate similarly works splendidly with this particular model as there will be no staying of cuts of bread in the focal point of the device thus, later also it will be anything other than hard to clean the contraption. The components of this model are moreover straightforward which suggests you can without a doubt use it with no inconvenience. The non-stick coating is applied. Plastic quality is not very good. Customer services are not satisfying. 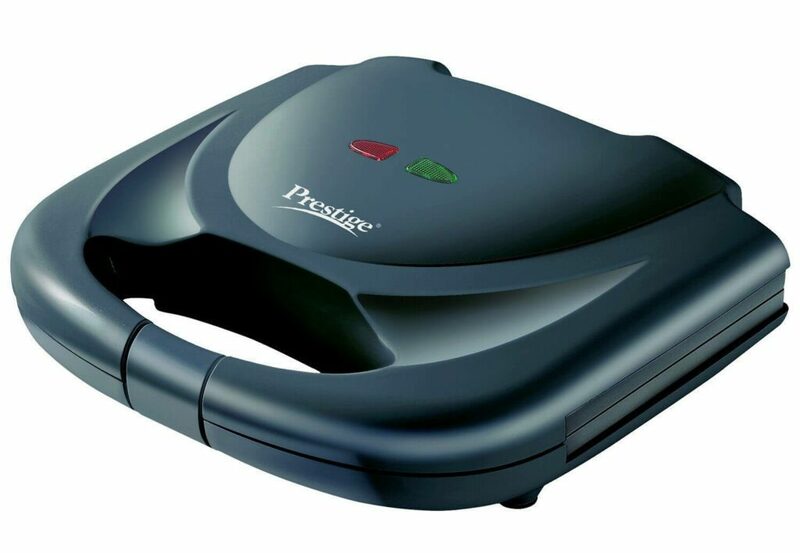 The Prestige PGSFB 500-Watt Sandwich Maker has a simple push-down bolt framework introduced inside it that is a decent property in the event that we consider it as a security include. A unique non-stick covering is connected so as there will be no staying of bread pieces amidst the sandwich creator and later additionally, there will be no trouble in the cleaning of the gadget. A vertical, minimized capacity and high power are accommodated quick warming outcomes alongside a prepared to cook light element. A cool touch handle is available so we can undoubtedly convey the sandwich creator. An elastic likewise guarantees that it remains in one place at the season of cooking. Container quality is not that much good. Moderate power required otherwise, the toast will get burnt. 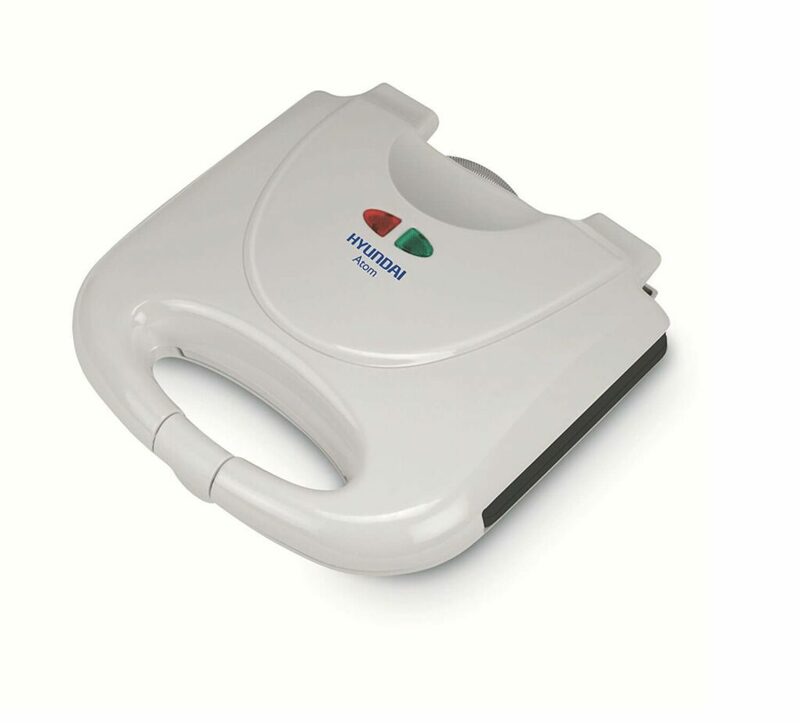 The Panasonic NF-GW1 760-Watt 4-Slice Sandwich Maker is a non-stick sandwich maker with hello survey development, which suggests that no bread can slow down out in the midst of the sandwich maker. Light indicators(Red for power/radiator; Green for grill arranged or cut-off) are also presented for exhibiting about the operations that are being performed or the operations that are starting now done. Diverse components like slip safe feet and thermostatically controlled are moreover acquainted inside this particular model with grow the future furthermore the execution of the device. An oil drip collector tray is provided. Temperature control knobs are used. A constant supply of power is required. 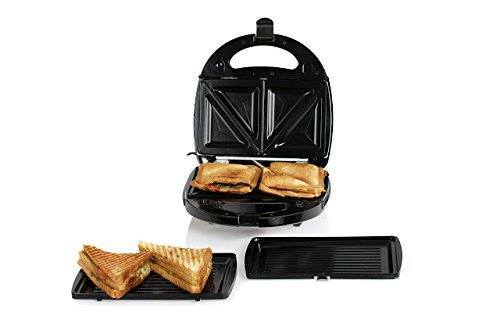 The Bajaj Majesty New SWX 3 Sandwich Toaster has a 2 in 1 work that joins distinguishable plates that infers one can without a doubt bring out the sandwiches with no staying issue. Adequately detachable plates moreover realize conveying triangle and fire sear formed sandwiches which are greatly luscious furthermore engaging. A non-stick covering plate keeps the remaining of bread in the midst of the contraption that further helpers in the cleaning technique. A cool touch handle is allowed that offers you to pass on it with no inconvenience. Temperature controlled by an indoor controller is moreover present in this particular model. Ready to cook feature is available. We were most impressed with the West Bend Grill & Panini Press, the Cuisinart Griddler Grill & Panini Press and the Hamilton Beach Panini Grill Gourmet Sandwich Maker. All of the units in our review made decent sandwiches but these three stood out. Although the cooking surface is a little small, the quality of the sandwiches the West Bend Grill & Panini Press produced each time was undeniable. Whether we were making a basic grilled cheese or a panini, this unit toasted the outside and melted the ingredients inside perfectly, every time. The temperature and textures were spot on, demonstrating that it can be worth buying a specific tool for hot sandwiches. The Cuisinart Griddler Grill & Panini Press also made a good impression throughout our testing. This sandwich maker took longer than the others, but it was worth the wait. The sandwiches came out crispy on the outside and evenly cooked and delicious on the inside. The Hamilton Beach Panini Grill Gourmet Sandwich Maker lives up to its name by making basic sandwiches feel special, gourmet even. This unit produced all of the right temperatures and tastes on a relatively large scale, so it would be a good fit for families. There are a lot of options for lunch and dinner, but a sandwich loaded with all of the best ingredients, hot off the panini press, is one of the best. A good sandwich maker can help you get something similar to that crisp, toasted sandwich that you enjoy at the neighborhood bistro, in minutes, in your own home. Total Capacity- It is one of the important factors to consider before purchasing the sandwich maker as your requirements might not match the size of the sandwich makers. On an average a sandwich maker can prepare two sandwiches of regular sized breads. 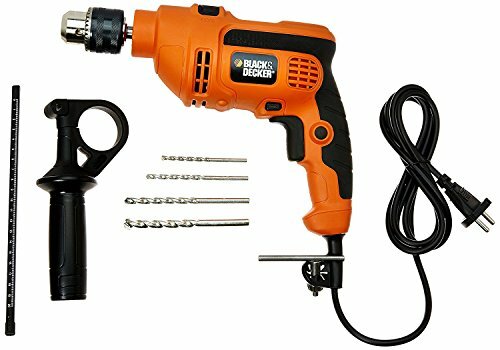 Auto-off- The auto-off feature is very important in all appliance as in our busy world it is not practically possible to wait for all sandwiches to be grilled. This also helps in saving the sandwiches from being overcooked. Sandwich Makers Technology – How Does it Work??? Sandwich Makers In India: In today’s world, for every house hold, sandwich maker is must require thing to have. Not for class but every house has at least 2 sandwich lover and why shouldn’t it be?